We are offering Honeywell Temperature Controllers to our clients. The Honeywell PID Controllers family of microprocessor based controllers combine a high degree of functionality and reliability at a very low price. Available in 4 different formats : 1/16 DIN, 1/8 DIN, 3/16 DIN, 1/4 DIN. These controllers are ideal for regulating temperature in a variety of applications. Honeywell’s 1/16 DIN Controller is a microprocessor-based controller that monitors and controls process variables such as temperature, pressure and level in applications such as environmental chambers, furnaces, ovens, and packaging and plastic machines. process variables such as temperature, pressure and level in applications such as environmental chambers, furnaces, ovens, and packaging and plastic machines. Model: DC1010/DC1020/DC1030/DC1040 With Relay/SSR/4-20mA/Dc Voltage Output and Alarm Output. 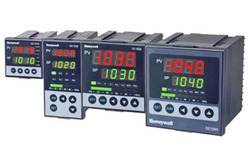 Honeywell Temperature Controllers At Wholesale Rates Model DC1010 , Others Models Also Available. Our clients can benefit from us an extensive array of Honeywell Temperature Controllers. We use superior quality raw material for the fabrication of this range. This controller has a microprocessor wit digitally display options to set the temperature cycle. Provided with a functional alarm system, this product records temperatures of over 6 to 7 days.